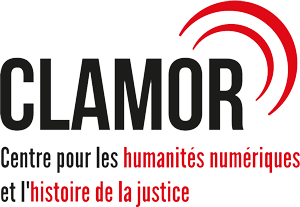 The CLAMOR team is composed of permanent members (from the CNRS and the Ministry of Justice), partners and visiting scholars. The CLAMOR does not offer the Associate Researcher position. The CLAMOR can however welcome a delegation of researchers and postdocs, if their program includes a digital dimension linked to the history of justice (construction of a new research instrument, creation of a corpus, online publication of research results). Read more information about this here. Partners are elected by the general meeting of the Unit for their effective cooperation in joint projects . They have an advisory vote at general meetings . Visiting scholar(s) status can be given to people staying in France for a fixed term and who develop digital projects linked to CLAMOR and collaborate effectively with the team.